On Metropolitan television, commentators argue the validity and sense of having people in tights trying to protect their cities again and again, with a key idea being that perhaps their presence might not only draw evil, but condone it. They break for a commercial announcement. At the Kent farm, Jonathan and Martha are preparing to go to the store, when the house explodes. A hand, the hand of an Atomic Skull, grabs Superboy by the hair, and reaches for Martha Kent. Superboy, unconcious, hangs limp. He beckons to Martha, "You're next. Then I find your husband. Don't ask me why. It's just gotta be done." Jonathan breaks his concentration by hitting him with a shotgun blast. The blast tears his hood off, making him leak radiation. A hand grabs the Skull, and an explosion immediately follows in the sky, and it is assumable that it is the Skull detonating. Meanwhile, Clark's old coach tears feet across the mat of the track trying desperately to get away from a hundred chasing Riots. Superman descends, puts them all in a barrel, and tells the coach that he's safe. Superman suddenly sprints to his dentist after securing his parents, and saves the doctor from a man in purple and green, Quakemaster. On the TV, the debate continues. At Clark's college, one of his professors is harangued by Hellgrammite until Superman comes and cashes Helgrammite's check. Superman apologizes and leaves. At Clark's old library, a student reads, holding the librarian in contempt as she runs by until Firefist appears, spouting literary allusions about his fire experience. Superman comes in and turns him into an ice unconscious villain type. He hands a book to the kid, The Grapes of Wrath. At Clark's physician's office, Ratcatcher unleashes his rats on the waiting room and the doctor before Superman arrives. At a reddish haired man's office (Clark's accountant), the Bug-Eyed Bandit ruminates in convenient monologue at the tied man until Superman shows up and ends the party. Superman ruminates about who is doing this to him in the air. At Clark's Eye doctor, Hi-Tech shows up to cause trouble before Superman whisks her off. At Planet Krypton, Jimmy and friends eat and debate before King Shark arrives to slap Jimmy around. Superman arrives after a signal watch beeps him, and he tears King Shark about before leaving him a broken heap. Superman tells Jimmy not to feel bad, then sees smoke pouring from the Daily Planet building. He realizes, "Lois. ", then tears off for the building. End issue. Story - 4: I take one point for little inconsistencies and continuity erring, to be heretofore stricken to the world, but all in all, I have to revise myself. 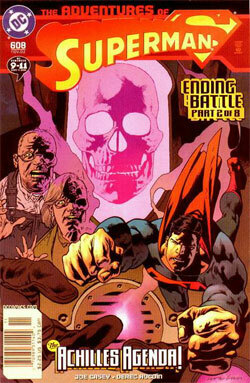 A few weeks ago, I pointed out that for all intents and purposes, Superman, in the comics, is dead. I rescind. He is alive and well, returned from the dead, and here he is. This is what we've been waiting for. Something somewhat continuous, with good writing, a tense feel, and a lot of potential character development. I have no idea, this could fall off in the middle like Return to Krypton II, but it seems to be flowing well and going on all thrusters of late. Maybe this is the kicker that might bring Superman back to the level of storytelling we had last year. I love seeing characters I thought were beyond the current teams, like Riot, Hellgrammite, Atomic Skull, and the like. I don't like seeing strange, obscure, non-Superman characters. Ratcatcher? Quakemaster? What's that, the first cousin of Earthquake? We could have had Metallo! Or Cyborg! Or Doomsday! Heck, there's still six issues. Maybe I should shut up. But then, as I state below, there isn't much room left for more haranguing villains. I do believe, instinctively, that nothing of consequence will happen in this series, simply because it would have made Wizard, and it would have stirred things, so that consequence factor is a bit torn, but as a whole, I love the story thusfar, with one exception. Now, Neutron was last issue, and by all rights I should leave that to Nick Newman, who did a great review, but I have to take issue here with Neutron. I mean, I love Neutron. He was the first villain I ever read in a Superman comic, back when I was a kid, and it was a two parter, and Neutron was really, really cool for a kid my age. Then, they brought him back, in the Death of Clark Kent, and it was neat, but then they bring him back, completely disregarding his appearance in Death of Clark Kent by pretending they hadn't met (or making it seem that way) eh, pet peeve, this whole continuity thing. Oh, bless and keep those of ye out there who have only been reading for the past three years. Enjoy it. Uber Kudos to the writer for putting Planet Krypton in there. It's from Kingdom Come, for those of you who haven't read it, and it's a really sweet reference. One thing I have to admit...even if I were Superman, I wouldn't remember half of these people Luthor's attacking. Honestly, how many of you out there can name your doctor, your dentist, your eye doctor, your high school coach, and your pal in rapid succession, much less find them and save them from Super-Goons? Such crazed formulaic torpor! The bad news? Superman has had every major person he's ever known, period, assaulted by some lame, taken-out-in-one-shot villain this issue. The good news? There's no one else that Luthor could POSSIBLY attack. Serious. He has to have sent a villain after everyone in the world, save the newspaper guy and the black cop from the last few issues, but face it, they're dead. I loved the Grapes of Wrath reference. As an English Major (with a capital M, for never gonna earn any M-oney), I happen to find that book an enigma, something that has such a horrible story with such great writing. An odd combination, to say the least. A bit of an aside, sure, but I owe the book an homage, as it inspired me to use the format Steinbeck virtually created to place what I thought to be a cool story in, and, I hope, create something good. My second book. The jury's out, and this obscure wandering is up. On with the review. As another odd thing, it is of further note that on the same page as the Firefirst being taken out, there is an ad for a show called Firefly, at least in my American copy. Interesting. WHAT DOES IT MEAN? Told you I was an English major. And I do it good. Sigh. Atomic Skull wasn't clearly disposed of/dead. All we saw was a big cloud. To say nothing about the deadly radiation released when his hood was destroyed, likely giving Martha, Jon Boy, and even poor Superboy eighteen irreparable cancers. Whups. Riot was put in an open container (admittedly knocked out, but this is Riot, who splits when hit.) and said to be contained. He needs his phase put back in line, and sleep, to be back to normal and "contained." Whups. Maybe Luthor gave him new powers we'll just never be privy to that will suddenly disappear before the next appearance...uh...yeah. Now, continuity-wise, this book stank. Then there's the big picture, with Neutron. But still, all of this aside, I've said it before, I'll say it again, take all of my continuity. Fine. Do it, you repugnant fools! But if you give me a good story, I'll cheer, and this issue got my blood pumping. Good work. Art - 4: The art took a rather hectically written storyline and only fell off in clarity once, with the Atomic Skull thing. I assume, as well, that that might have been the writer's doing. It's not fantastic, amazing, jump out of your skin work, but I knew who all of the characters were, and I wasn't distracted by the many-panel format they adopted in quite Miller Dark Knight Returns style (cough cough THE TV THING WAS A RIP-OFF cough cough). Still, joke aside, who couldn't use more Miller style all up in DC? Maybe not on Superman, but then, Superman wasn't killing/disfiguring/bitter in this issue, so the Batman aspect of the whole illusory concept didn't manifest itself, leaving the art fairly spot-on and with the pace. Cover Art - 3: Wow, the Kents must have opened the Ark of the Covenant. DON'T OPEN YOUR EYES, MARRION! And then Superman, flying away from the Skull, just for good measure. Dark, and without background, and with that horrible logo illustrating this even further. The covers, the covers, please, lord, someone do something about the cover lettering. I had an eighties He-Man flashback, and I thought Skeletor was lunging out to get me, along with the Indiana Jones thing, ack! Stuff that scared me as a kid coming back to give me pathos in my adult adulations about comic books. YIPE! Still, it was a striking piece, and at least it went with the last issue. Average. Check out the Comic Index Lists for the complete list of Superman-related comics published in 2002.